Wrong. Although not found on the mainstream platform, with a little digging and effort, the truth can be ascertained. There are still hundreds of truth-loving citizens all over the world, there are journalists who risk their lives to report as it happened and there are millions of people who will sacrifice their life for justice. 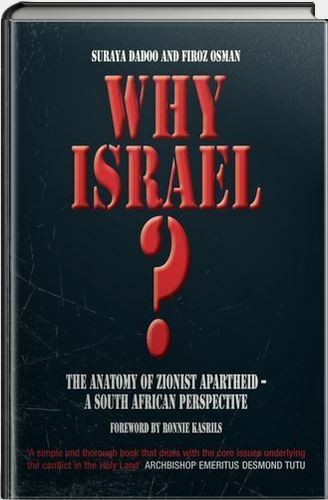 Added to this, we now also have “WHY ISRAEL?”, a book noted for its painstaking efforts in scouring the globe for the side of the story not often told by the world. The co-authors of the voluminous book, Dr Firoz Osman and Suraya Dadoo, are long standing patrons of the Media Review Network – a vigorous advocacy group in SA devoted to amongst other issues, the Palestinian problem, which seems to be only becoming more and more complex day by day. They have made a bold attempt at telling the “untold” side and to make the unofficial version, official. The uniqueness of this book is undoubtedly in its comprehensive nature. Covering all of 68 chapters, it provides an update on issues right up to late 2012. Reading through the pages on the various Zionist atrocities meticulously planned and carried out with complete impunity may give a sense of helplessness, but the authors have inspired us with hope. And this, to me, is what reveals the purpose of the authors in publishing this work. It’s not just a chronicle of the political misdemeanours and misguided religiosity of the Zionists, but a plea to humanity: like how the frail Saul killed the mighty Goliath, likewise Israel is not the invincible monster we are led to believe. In fact, we can, and people have, engaged them on various levels of this conflict. Everyone can and should play a part in the struggle, and all will come up with varying degrees of success. For example, the authors have documented various efforts, like the recalling of the SA Ambassador to Israel in June 2010 when the Zionists fired upon the humanitarian flotilla delivering aid to Gaza, the pressure of the BDS Movement upon Reggies, the retail toy giant of SA, to cut off ties with the JNF, and the announcement of Rob Davies, the SA Minister of Trade and Industry, to introduce legislation calling for the re-labelling of goods from illegal settlement in the Occupied Territories. On page 632, the authors should be lauded for saying: “Now is the time for America – the pit-bull of Isreal and which finds itself on the wrong side of history all the time due to Israel – to abort its ties to and controls imposed by its unreasonable support for a state that walls in those it does not like or tolerate”. For South Africans in particular, coming from an Apartheid past, the authors have helped us to understand – in chapter 37,- the similarities between SA and Apartheid Israel. The Israelis have, however, taken great pains to show us that Israel does not practice Apartheid, and the authors have excellently debunked these myths. In doing so, Osman and Dadoo have restored our faith in our own thinking abilities and are alluding that if any nation can champion the cause of Palestine, South Africans can do it the best. This is one of the best books ever written on the Illegal State of Israel. It exposes the truth about why the illegal occupier of Historic Palestine is regarded as an Apartheid State. It also goes on to state factually why, and details how Apartheid Israel can not continue to exist as all unjust systems are bound to fail. Israel however denies it is an Apartheid State despite hundreds of Apartheid laws in it’s statute book. Nobel lauriette Archbishop Desmond Tutu, a truly respected South African struggle hero who spent most of his life fighting Apartheid in South Africa, says the brutal form.of Apartheid in Israel makes South African Apartheid look like a Sunday school picnic. Suraya Dadoo and Firoz Osmans writing style is easy to read and simplifies complexities making it easy for the reader to grasp.